Want to know about upcoming sessions of Exploring Welding? Sign up to be notified the next time it is offered. Can’t decide what type of welding to take? Explore the varied possibilities of oxy-acetylene, arc/stick, metal inert gas (MIG), and tungsten inert gas (TIG). You will get the chance to try all four, gaining an understanding of which type of welding is most appropriate for the projects you want to complete. Can't wait to explore the different areas of welding in class? 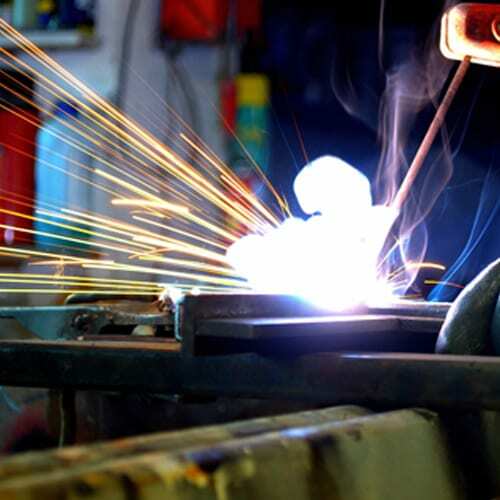 Take our online quiz, Which Welding Should I Take, for a brief overview. The Crucible is conveniently located at 1260 7th Street, Oakland, CA, just two blocks east of the West Oakland BART station. There is a student parking lot with spaces available on a first-come, first-served basis. The lot fills up quickly, and we encourage students to bike or take public transit to class. For weekend or weeklong classes, there are great places to grab food around the area, including at 7th West and Mandela Grocery Cooperative, as well as a microwave on-site at The Crucible for students who wish to warm up packed lunches. At The Crucible, you must dress safely and appropriately. Arrive for class in all natural fiber clothing, closed-toe shoes, and long pants. Nylon, polyester, spandex, or other synthetics are not allowed around machines, equipment, or processes that can produce hot fragments, sparks, or flames. Layers are encouraged as the the studio can be very cold or very hot. Additional protective gear will be provided as needed. Students who withdraw at least seven days prior to the first scheduled session of a class will receive a full refund, minus the non-refundable $50 registration fee. No portion of tuition will be refunded or transferred if a withdrawal is made less than seven days before the class start date. Classes are subject to cancellation based on enrollment. If you are interested in taking a class, register early so we know you're interested! There are no make-up classes. No exceptions. While it is infrequent, instructors are subject to change. See all of The Crucible's Policies & Resources here.